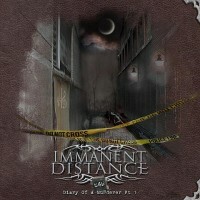 Said to be formed after a split within DEPRAVITY, an obscure West-Flemish Death/Black Metal band, IMMANENT DISTANCE is young female-fronted Melodic Metal band, formed in 2005 according to Metal-Archives.com. The band released a demo (“Transcend”) in 2009, which quickly sold out. Several gigs and lots of practice and writing later, the band put out its debut full-length: “649: Diary Of A Murderer Pt 1”. The story is about a man who’s accused of murder and therefore is trialed. In nine tracks, divided over 4 scenes, we follow the suspect, the murderer, in this part of his life. A part he can’t quite place as he can’t remember having killed anyone, yet all elements tell a different story… and it’s not in his favour. Little by little, it becomes clear that things aren’t what they seem. A scheme has been set up, set up by the government in a new kind of project. To find out all about it, you will have to buy the album, of course. The nine tracks on this album are divided into 4 groups or scenes, from “Confrontation” over “Accusation” and “Manipulation “to “Desperation”, where things really begin to unfold and not all hope is lost. “Prologue” is an intro, dominated by the cello and orchestral input later on. As we’re not dealing with “A day at the beach” kind of story, the music is a clear indication of the dark tale that is to be told. Speaking of the music itself in this intro, I have to admit that it sounds like it was featured in a video game, an RPG or RTS one. So yeah, something more realistic would have been better. Still, it’s trivial, the important thing is that it does the job. This steadily leads to a full blossoming of the expected Metal part. Calm at first, then bursting loose with pounding female-fronted melodic Metal. The chorus holds both male and female vocals. There’s room for solos, obviously. All ends as it started. “The Symphony” is one of the best tracks on this album (in my humble opinion, of course). It’s dark and sad/emotional. The beginning is not bombastic, just vocals, zills and a clean guitar. This pattern remains as more music is added, as the whole becomes more Metal. The added violin beautifully expresses the sad and touching side of the song, i.e. the chorus. The verses, on the other hand, are firm and Progressive, with melody coming from the violin and piano, contrasting with the power of guitars and drums. The guitar solo is inline with the music of the chorus. Here as well, the song ends like it started. Kudos to Maaike (vox), it must be said. And so the “Accusation” begins, starting with “The Accused”. A mysterious intro with Eastern influences before the the song takes off. While the keyboards provide melody and backing, the verses are guitar-driven. The chorus offers melodic/symphonic Power Metal, short but powerful. The vocal input is delivered by female leads (for obvious reasons) and the occasional grunt. It’s also nice to hear how the band inserted a symphonic break, sort of like RHAPSODY OF FIRE on their “Symphony Of Enchanted Lands II” (2004) album. Little by little it’s back to business with the guitar-driven Prog/Power Metal. The keyboards do become more important after this and you could compare it to e.g. DREAM THEATER, VANDEN PLAS and so on. One more time the verses-chorus pattern and then it’s solo time (guitars and keyboards). Each member of course did well, but I do have to give kudos to Dries (drums) this time. After our character is accused, the next step is “The Lock Up”. Starting with drums and pounding Power Metal. with the addition of guitars and keyboards, this turns into Techno Power Metal. Very nice! The verses keep the power, while the keyboards effortlessly provide melody and backing. The tempo drops a little in the dark bridge, leading to the emotional, melodic chorus. Again DREAM THEATER, VANDEN PLAS, CIRCUS MAXIMUS, etc. come to mind. Especially in the bridge that follows. The guitar fiddling seems to express some kind of madness with the main character in the story. Or ist it just my impression? Solo time is divided into two parts, first with guitar and keyboards, then dual guitars. The latter one being more Bluesy. And not that happy. “Narcosis”, the first of the “Manipulation” scene, takes a direct start. Main instruments: guitar and piano. Again there is the contrast between powerful verses and the melodic chorus. Extra, exotic spices are delivered by the keyboards. This song also holds a nice Progressive rhythm and dito melodies. It’s good to hear that it’s not always straight-forward. When the music speeds up a bit, it’s as if there’s hope at the horizon, yet one cannot deny the emotional side of the matter… and the DREAM THEATER influences in the lyrics (album titles). Instrumental talk takes care of the ending. And so we head “Into The Courtroom”, the longest track on the album. This one also has a direct beginning, pounding and bombastic. See it as a mix of GWYLLION and ARTRACH. Keyboards again linger in the back, while guitars and drums handle most of the work. The bridge (or pre-chorus) is of the melodic Power Metal kind, linking with a slower, emotional chorus. The chorus music serves as backing for the dual guitar solo, which is very nice. The twist that is activated after this is dominated by the keyboards and once more CIRCUS MAXIMUS (and DREAM THEATER) pop around the corner. Here it’s the music that does the talking and another solo round (with exotic touches) leads the music into Progressive territory. Twelve minutes is the track’s length, but do take your time give it a some spins to let all be revealed. The story is coming to a close, at least for this first part. The last scene, “Desperation”, is set in with “Begging To The Skies”, again letting the drums pound away the first notes. Pounding verses lead to the chorus, where the band found it fitting to go into a galloping mode. However, as the title of the scene indicates, there is indeed desperation. The main melodic input this time comes from the guitar. Lyrically it’s nice to hear how the tables are turned, how our character suddenly isn’t that guilty anymore. (?) Dark, male vocals are added to demonstrate this, albeit quite short. A slow, emotional piano-driven piece precedes the guitar solo, which then makes way for pounding, anxious-sounding music. The end. “Facing Facts” is the ballad on the album. At least, that’s how the first portion of the song sounds: piano, vocals (both female and male). If it were just this, it would be the ugly duckling (so to speak) of all songs. But rejoice, salvation is near as the Metal sets in. Rhythm is the answer. However, it does not bring any sunshine and considering the story… it would be a bit awkward. To be honest, though, I did find these last two tracks a little less strong/attractive/interesting compared to the majority. Anyway, one more to go and that is “Salvation”. Yes, now all the pieces of the puzzle can be connected to reveal the dark and evil mysteries that have punished and plagued our character. Will he be set free? Will all return to normal? This song, like most others, takes off instantly and again the DREAM THEATER comparison cannot be neglected. But that’s ok and perfectly normal. The acoustic verses connect with a melodic bridge that sounds hopeful, yet the heavy chorus seems to counter it a little. Still, the accessibility of the song is high. Progressive input comes out mainly though the instrumental talk. Pedal to the (M)/metal is an indication that things are clearing up, but why must they slow down for the solos (which are short and functional, by the way)? Regardless of this, you can sense there are better times ahead, indeed. All ends in SAVATAGE-style, comparable to “Edge Of Thorns”. While I’m not familiar with IMMANENT DISTANCE’s first release, I have to say they pleasantly surprised me with their debut full-length “649: Diary Of A Murderer Pt 1”. There’s a story behind the music and the music is adapted according to what happens in each song and scene. Many bands have taken this road and especially SAVATAGE comes to (my) mind (“Streets”, “The Wake Of Magellan”, “Poets And Madmen”). The Belgian scene is dominated by extreme Metal bands (Thrash, Death, Black), so it’s good to see there’s hope for the melodic/Progressive/Power Metal future as IMMANENT DISTANCE contributes to that change. In short: while there is (always) room for improvement and what not, “649: Diary Of A Murderer Pt 1” must be added to your Prog/Power collection, for it is definitely worth it! I, in any case, am looking forward to “649: Diary Of A Murderer Pt 2”.